With an overwhelming amount of precise instructions, purchasing the correct UL labels can often seem quite daunting. For example, did you know that while they often are referred to collectively by the moniker “UL Label,” there are actually multiple types or categories of UL Labels? That’s where we come in–we’ve read up on UL to consult, help you navigate its intricacies, and avoid issues with your UL inspector. To recap, as the requirements vary greatly between different types of UL labels, the best way to think about them is to split them up into two categories: UL 969 (durable labels) and UL Marks (UL logos). Labels that need to meet the durability requirement of UL 969 Labels and Markings standard need to use pre-approved / pre-tested material constructions that are on file with UL. Quite differently, labels with UL Marks don’t require a specific material. Rather they must have the layout of the logo and other required elements verified. It is worth noting that if a UL mark (logo) is included on a label that’s required to meet the UL969 standard–which is permissible–then the material and verification requirements of both are required to have an in compliance label. 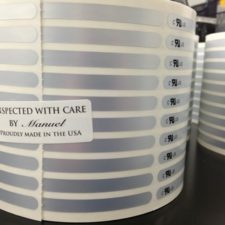 Once you know what type of UL Labels you need printed, it’s important to identify the various requirements of that type. We are here to solve that problem. 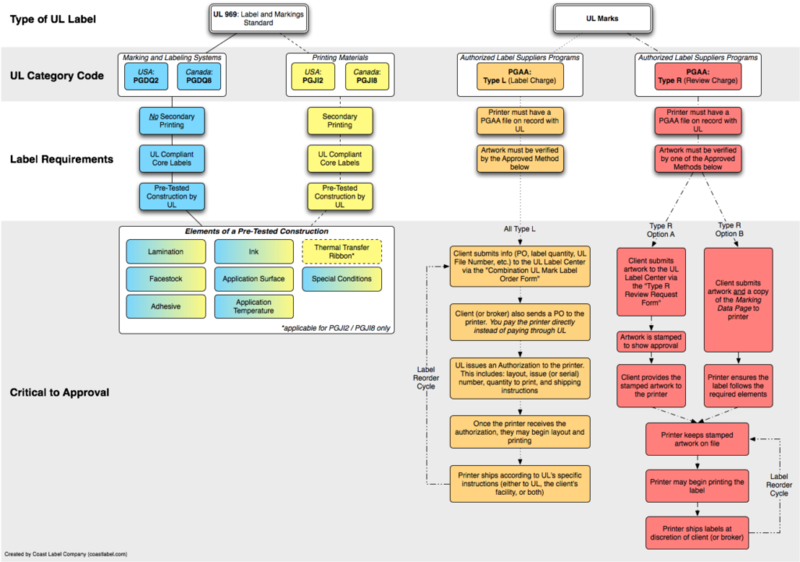 The below chart (click to enlarge) is designed to quickly and clearly delineate the differences and requirements of the different types of UL Labels. The tabs below break out the different types of UL Labels in greater detail. Looking for more? Feel free to contact us at ULexperts@coastlabel.com to reach our UL product team. For information regarding our current certifications and Recognized constructions please visit our UL Certification page. There are a variety of UL certifications symbols that are collectively referred to as UL Marks. 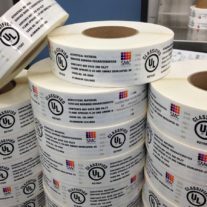 Labels that are printed with a UL Mark are not required to have specific UL approved label material, ink or durability requirements just because they have that mark. That said, the evidence of a product’s UL certification is the UL Mark. If it should come off, then that product is no longer considered UL certified. As a result, there sometimes are additional printing requirements that are described in your Follow-Up Service Procedure. This may require a label to be made from a specific material, ink or meet specific durability requirements. Be sure to check if any such requirement exist. 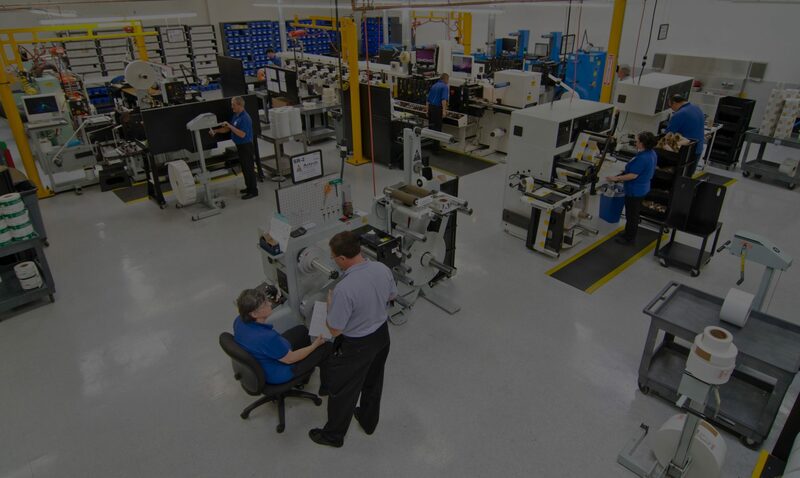 There are two types (sometimes referred to as Follow-Up Service or FUS) of UL Certification marks: Type R and Type L. Which “type” a label falls into, varies by product category and depends on what level of control UL wants over the printing process. If you are unsure of which type your product falls under, you can look up this information usually either on the Authorization page of the Follow-Up Services procedure or the Marking section of the Section General. You are free to scan/fax us a copy of these sections, so that we may help you properly assess your labeling needs. 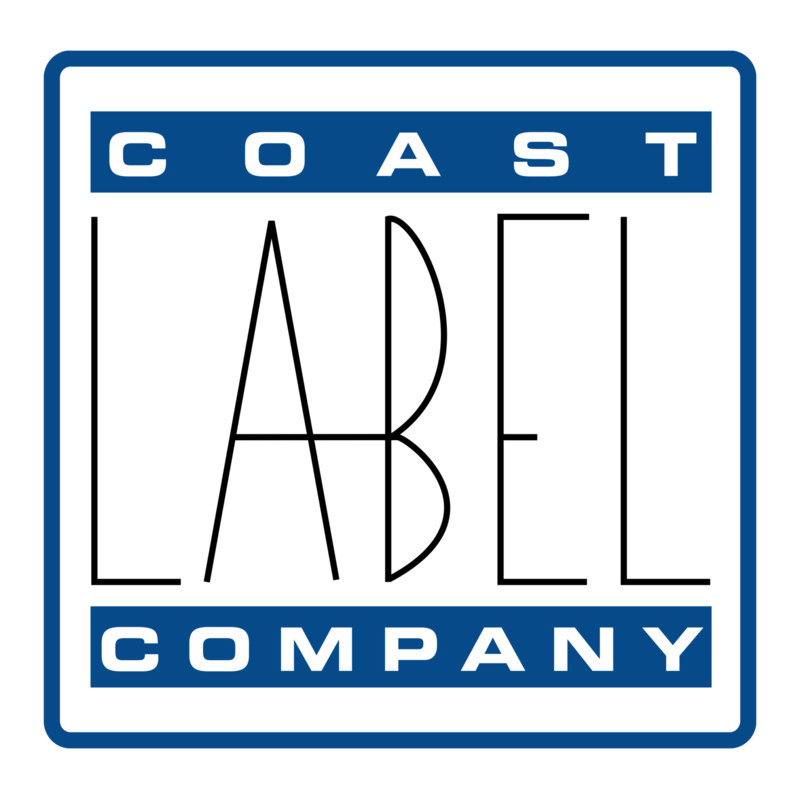 Coast Label—or any other company for that matter—cannot print any Type R labels unless we have artwork stamped by UL or we have a copy of your Listing Mark Data Page or Classification Marking Data Page. A benefit of our quality control systems, is that we are able to keep these approvals paired with your product, allowing us to run repeat printings of the approved design without delay incurred by requiring additional UL permission. You may have us include (or print later at your facility) additional information on the label (including company name, electrical ratings, warning markings, date codes, place of manufacture, etc.) as long as none of this other information interferes with the UL required elements of the design. 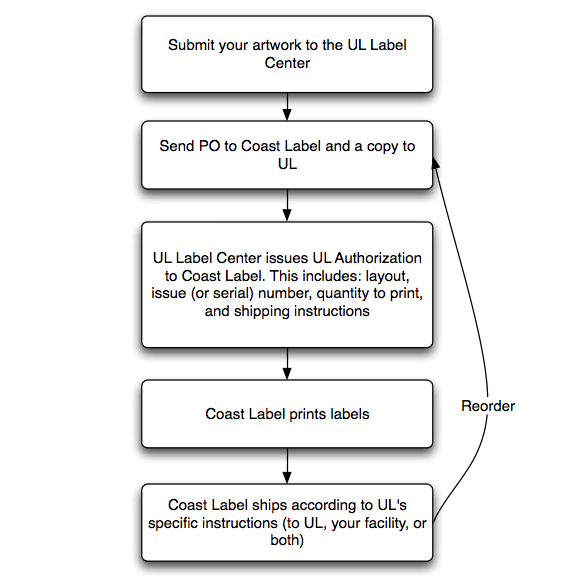 Type L labels require UL Authorization from a Label Center each time they are printed. The Issue (or serial) numbers are variable numbers used specifically for Type L Marks and are assigned during the label ordering process. The quantity of labels will be specified by UL on the order authorization form. UL may also specify the label material, packaging, and shipping instruction. This information would be included in the “Terms and Conditions” which are unique to each UL authorization form. 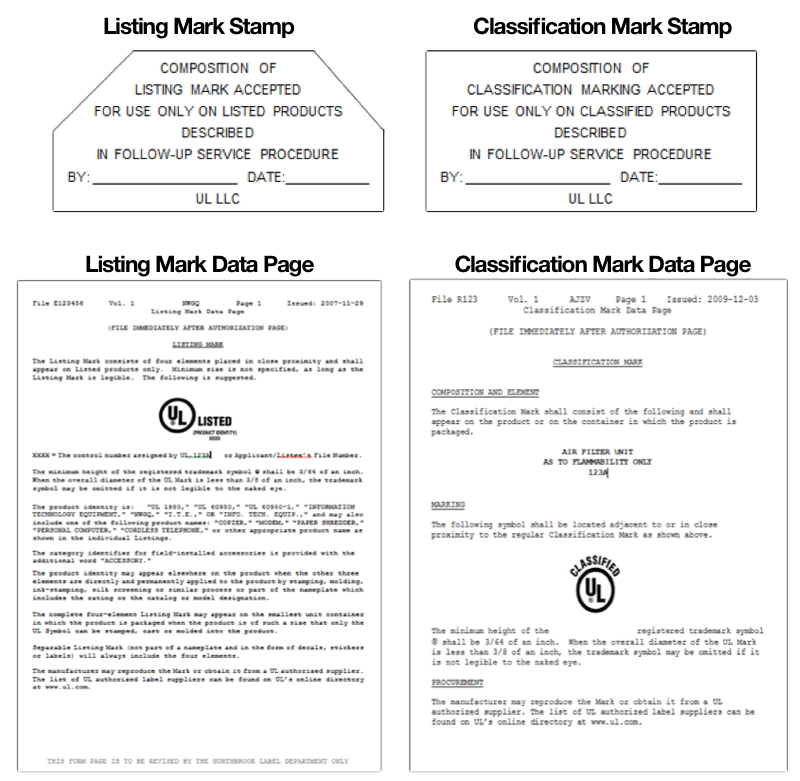 As with Type R labels, you have some leeway to include other information along with the Type L Mark including electrical ratings, warning markings, date codes, place of manufacture, etc. During the safety testing of finished products, a UL engineer will often determine that a product safety label is necessary. UL requires the various components of a label (altogether known as a construction or system) to meet specific performance requirements including temperature and environmental conditions, to ensure that these labels will remain attached to the product and legible. Product safety labels that pass UL969 testing are called UL Recognized Component Labels. Under the heading of UL969, materials are exhaustively tested by UL engineers to determine a label construction’s suitability across a variety of environmental conditions. Included are humidity, heat, scratch and adhesion tests. Based on the results of these tests, the individual materials are then rated to certain performance levels. This brings us to your specific labeling needs. As with UL Marks, your UL procedure book contains your specific marking requirements. It is in there that you are able to determine if you need UL Recognized labels, and what exactly those performance requirements need to be. Information for markings will usually be on either a markings data page towards the front of your procedure documents or in the Section General (usually noted as Sec. Gen. within the book). 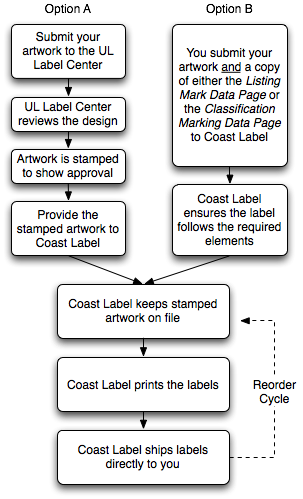 You are free to scan/fax us a copy of these sections, so that we may help you properly assess your labeling needs and determine the correct material construction. Once receiving the Recognized component label, you may use thermal transfer ribbon, laser toner, or hot stamping foil printers to add additional information (apart from the UL required safety information) to the label, as long as those printers are capable of producing legible printing with good initial ink adhesion. Their may be additional types of printers/methods allowed as long as they are noted in your marking procedure. It is worth noting however, that hand-written pen, marker, or pencil is never approved by UL. It’s important to stress again that this information is “additional,” and not part of the UL required safety components of the label, which we must print following the procedure printing guidelines.